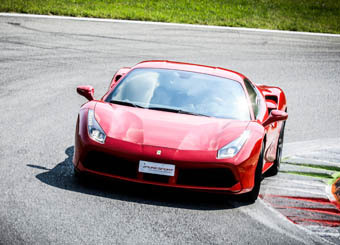 Driving a Ferrari 488 GTB is one of the sport racing experiences that most resembles a real racing experienceThe track of Vallelunga, easily reachable from Rome, which is about ten kilometres away, includes new garages, a wide main start/finish straight and a lot of services for welcoming drivers and their guests to spend an unforgettable day on the track. 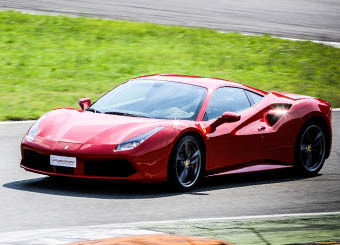 Puresport introduces you the new born in Maranello: the fast and brand new Ferrari 488 GTB, a car that has been presented by Ferrari in 2015, as the successor of the Ferrari 458 Italia. A.lot of technical improvements compared to the previous model: the drawer nose wing, new “dug” doors to channel air to the rear air scoopes, a new exhaust of the same style of the one of the Ferrari 458 Special , a new rear fog light styled like the one of the Ferrari F12berlinetta and a retractable rear active wing. V8 Engine, 90° IHI bi-turbo, with a capacity of 3.902 cc. Performances from 0 to 100 km/h in 3.0 seconds, 0-200 km/h a little bit higher, coming to 8.7 seconds. Maximum speed of 330 km/h. From the beginning, the manufacturer has highlighted its big versatility: track performances totally usable for everyday driving, also for not professional driver. 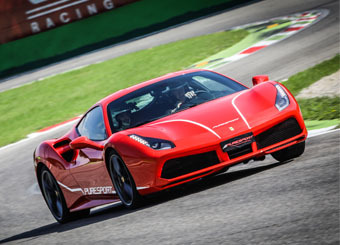 A real automotive jewel that Puresport makes available from now on, on the nicest Italian racetracks and especially on the very famous Monza one, the perfect location to unload all these hp of power: hurry up and book the first available date.